Alright, let’s be real… Studying isn’t always the bee’s knees BUT why also get stuck in boring accommodation? 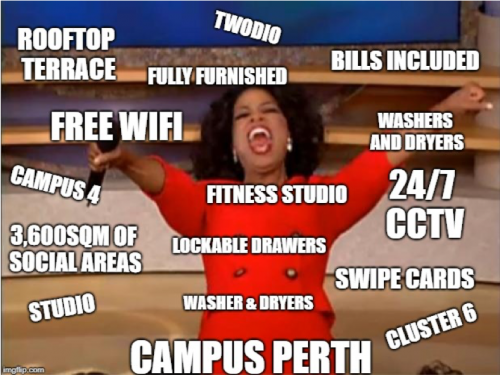 Campus Perth is here to save you from being #basic 💁 by giving students what they want – NEXT LEVEL ACCOMMODATION! Remember watching those American college movies and wishing Perth had that? Well, guess what folks? Now we do! Oh and not to mention they are giving away up to $2K FREE rent if you book before October 31st! Did we mention there was going to be MASSIVE 3,600 sqm of social and communal areas?! Come over to The Link, our co-working space, for some heads down bums up! Campus Perth has got meeting spaces paired with high speed WiFi for all your group assignment needs. Sick of studying and learning all day erryday? Head on over to The Commons, Campus Perth’s own socializing space, where you can shoot some rounds at the pool table or have some top quality banter with your mates. Need to release your stress? Campus Perth have got you covered! Our Fitness Studio (included in the rent – free gym membership yo!) is decked out with cardio machines, weights, boxing facilities and even a yoga studio! Don’t forget about The Rooftop which will be holding the sickest Campus Perth parties organised by our awesome Events team. Go ahead and take those rooftop #views4days selfies with your mates! Now let’s chat rooms! Campus Perth has the Studio, Twodio, Campus 4 and the Cluster 6 – which room will be yours? Reckon you’re the residential social butterfly who doesn’t mind sharing and closely bonding together with the gals over how you need a Peter Kavinsky in YOUR life – the Campus 4 is perfect for you! Perhaps you’re the complete opposite? ‘Sharing? What’s sharing? Ain’t nobody got time for dat.’ Get a room all to yourself in our Studio where you have plenty of storage space to store all your latest Nikes, Supreme, YEEZYS and heaps of desk space to study in #HYPEBEAST style. Looking for a lil something in between? Where you love your personal space but feel like having a bit of a bantz every now and then – ding, ding, ding the Twodio CHOOSES YOU! We hope you are just as excited as we are for January 2019! Book in a room tour visit to see Campus Perth’s fully furnished and funky designed rooms HERE! Give Campus Perth a ring!